The January-March issue of ANS focusing on emerging theories for practice is now available! Nursing models, theories and philosophic frameworks have been emerging for over 50 years. But they have not always been welcomed as relevant to nursing practice. Part of the disconnect lies in what “theory” is thought to be. My own favorite definition of “theory” is “a vision – a mental construction of what could be in human experience. In nursing, these mental constructions provide a roadmap, a path to follow in shaping human experience toward wholeness and well-being. 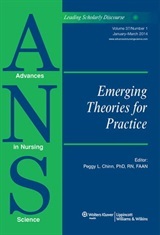 This issue of ANS includes current thinking in nursing that clarifies how and why nursing theories are essential to nursing practice, and articles that illustrate current theoretical developments in nursing. Most important I believe this issue of ANS points in the direction of meaningful connections between theory, research and practice. The first article in this issue was published ahead of print, and it is now our first featured article! The article is titled “Particularizing the General: Sustaining Theoretical Integrity in the Context of an Evidence-Based Practice Agenda” by Sally Thorne, PhD, RN, FAAN, FCAHS and Richard Sawatzky, PhD, RN. Dr. Thorne and Dr. Sawatzky have extended their discussion of the “evidence” debate with a message for ANS blog readers that we featured in December when it was published ahead of print. We will be featuring each of the articles over the time that this issue is current, so “follow” this blog to have our blog features with messages from the authors!